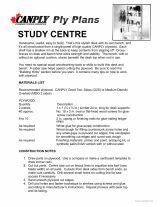 Build a desk or computer desk with free woodworking plans. There are simple wall mounted desks or elegant rolltop Mission designs. Build a desk for office, students or family room. Free DIY instructions for building other office equipment such as a message center or bulletin board lend a personal touch to a busy office. The design of this desk allows for a series of stacked compartments, shelves, drawers, and nooks. Using these plans you can make an adjustable desk. Build your won stylish desk and bench with just one sheet of plywood. This handsome desk styled in pine will fit anywhere. This is a most practical desk to have in an office for drawing, drafting, and writing. This rugged and sturdy desk is great for kids or you can customize it into a larger desk. 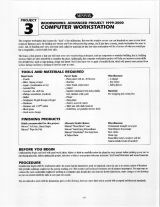 Plans for a computer workstation that will last for years. Build a computer desk that holds all your hardware. Using these plans you can build a table for your home computer. Here is a small, yet functional desk caddy to hold all your writing utensils and supplies. Detailed plans to make your own computer monitor riser. 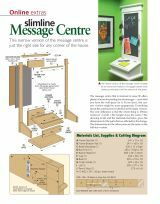 This narrow version of the message center is just the right size for any corner of the house. Build this letter holder that has great sorting storage, and even holds your keys. Free plans are nice, but if you want to buy a desk plan instead, check out the listing below. Build a corporate style desk which is sturdy yet lithe.